It's Poe Dameron's black X-Wing! 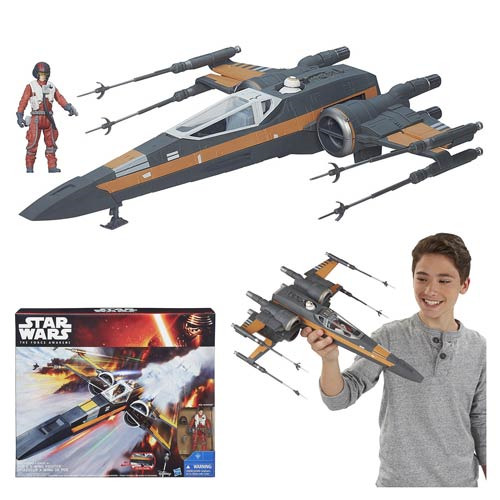 The Star Wars The Force Awakens Class III Deluxe Resistance X-Wing Fighter Vehicle is approximately 16-inches long with a 14-inch wingspan and includes 3 3/4-inch scale action figures with Poe Dameron and his Astromech Droid, BB-8. Featuring articulated wings and landing gear, this special fighter will help the Resistance to rebel against any evil alliances in the galaxy. Includes vehicle, accessory, projectile, and instructions. Ages 3 and up.